Good Afternoon Med 1 students here at the College of Medicine, President Barnhart and our distinguished guests who serve as cloakers, proud family and friends, colleagues. It is indeed a great honor for me to give this keynote address to my first White Coat ceremony at the College of Medicine. This profession has been an incredible privilege for me since the very first day of medical school and I am excited to further welcome you to Medicine through this ceremony. As a community Family Doctor and as a committed introvert I must admit I was always more of a sweater and khaki’s kind of doctor. But I vividly recall my own first white coat and the excitement and anxiety of first putting it on in front of the mirror and wondering who was this doctor look alike staring back at me. So there is little doubt that the role of the physician in society is changing. We now work in inter-professional teams, everyone’s scope of practice is changing, and the physician’s immense knowledge base is now available to everyone on their phone! So what does it mean to be a doctor? I was interviewed on this topic just a month ago by a consultant engaged by the Canadian Medical Forum – a high level alliance amongst all of our profession’s national organizations. I want to talk to you today of 3 aspects of the role of the physician that I discussed in that interview: privilege and the doctor-patient relationship; becoming a doctor and professionalism along the way; and the meaning you can attach to this white coat. By privilege I don’t mean the entitlement that comes from success or pride. In fact I mean the opposite. What I am talking about is the immense privilege we receive when our patients demonstrate their trust as they enter into the doctor-patient relationship with us. There is a social contract between society and our profession that confers on us great benefits like profession-led regulation, autonomy and substantial personal reward and society expects in return when they are ill or vulnerable in any way we, either individually or collectively, will always act in their best interest. I have a story from my own practice. Colin, an eighteen year old guy, ran his motorcycle into a moose one night and in an instant became a quadriplegic. His bright young girlfriend, Cathy, stuck by his side and when he left the hospital a year later they married. After that as a very young man I became their family doctor and we embarked on a remarkable 20 year journey together. Life dealt them and thus me many interesting challenges. What always amazed me was the humor and resilience they always demonstrated and the remarkable trust they showed in including me on that journey. She had obesity and early type 2 diabetes and he had frequent UTI’s and many hospitalizations for pneumonia. Along the way I delivered two daughters one of who developed chronic kidney disease. They always visited together and every challenge was met with met with a smile or a joke. One day they came in laughing and said have we got a story for you. As their kids grew they had got into a habit of going for a ride in their van whenever a serious family matter arose. On this occasion he said we should go for a drive and she responded that coincidentally she had something to tell him. They said Preston you are not going to believe this! First he told her their 16-year-old daughter was pregnant and then she told him their 15-year-old daughter was pregnant! And then they laughed! I was in shock but — what else were they going to do! And so I laughed too! Looking back I am still in awe of the fact they trusted me enough not to judge and that I would be there for them through another of the unending trials life would throw at them. I got to deliver those two babies and of course one of them developed chronic kidney disease. This rich and unique doctor-patient relationship is to me one of the most important aspects of being a physician and always must be cherished. Before I talk of professionalism in medical school I want to emphasize one unique aspect of our profession. Only physicians have both the immense breadth and depth of knowledge about the human condition and the tremendous toolkit, along with our colleagues and partners in the healthcare system, to help people in need. Doctors span genetics to geriatrics, renal physiology to population health, talk therapy to endovascular treatment of brain aneurysms, and the list goes on. Professionalism is the second aspect of our role and essential to how we apply that knowledge and toolkit. I have another story. Last week a frustrated faculty member was telling me of a fourth year student. This student was at rounds with the healthcare team, sprawled across a chair with feet up on a desk and started his case presentation with the words: “This patient says….”. This is one of those “count how many things are wrong in this picture”. First even the most casual amongst might perceive little respect, second the patient does not have a name and finally the patient’s story is considered suspect. Certainly not a stellar demonstration of professionalism. But that is not what worries me the most. When challenged the student’s explanation was that he was going into radiology and not much interested in internal medicine. I don’t know how you do radiology without immense knowledge of internal medicine but that is another discussion. Professionalism requires respect: respect for the knowledge you have learned, respect and understanding for how much you still have left to learn, and above all: respect for your patients and colleagues. Before I pass on my next piece of advice to you I would like to share some statistics. I know you are already thinking of CaRMS and our system seems biased to making you choose a specialty before even becoming a doctor. One third of you come to medical school with a firm fixed belief of your chosen field. I think a few of you can even trace this back to the seventh month of your gestation. One third of you have a good idea of what you want to be and one third of you have no idea! The important statistic is fully one half of those with an idea or a firm fixed belief will change your mind while in medical school. So my plea to you is this: medical school is your only chance to first become a doctor. No matter your field that breadth and depth of knowledge of the human condition is essential for every doctor-patient relationship. Keep an open mind, take it all in and first become a doctor. 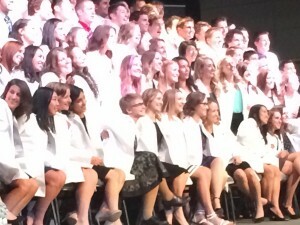 So what does this white coat symbolize to me? Remember, I’ve always been a sweater and khakis doctor. When I first went back to Dalhousie as a full time faculty member I was amazed. The first day in the hospital I saw a senior colleague in a white coat with 6 white-coated students following in a line closely behind. I must admit being tempted to follow along, just to see if they really would follow him right into the bathroom! Seriously this is important because some have criticized the white coat and white coat ceremonies as symbolic of entitlement and elitism. I choose to view it as a symbol of altruism. Altruism is defined as the selfless concern for the well being of others. It is a key component of the Hippocratic oath. Heroic examples abound such as the famous Canadian Norman Bethune in Spain and China who was a friend of the first dean of this college, Dr. Wendell MacLeod. Today I think of all those health colleagues now in Africa fighting the Ebola epidemic. I don’t ask for heroism everyday but what I do ask for everyday is you always put your patients needs first. This word privilege is interesting. Just over 100 years ago doctors were in private practice and the hospitals were for the poor and the patient faced less than even odds of benefit from approaching either doctor or hospital. But as medicine advanced doctors needed the hospitals to help their patients and thus applied to work in the hospital. That was and still is called “hospital privileges”. So patients give us their trust and the healthcare system gives us privileges. This trust and those privileges are dependent on us putting the patient first. As I said on your first day you are now in a new learning dynamic where the patient is as integral and essential to your education as your professors. Over the next 4 years your patients will be paying it forward in teaching you. They will be your very best teachers. Cherish the doctor-patient relationship, embrace and practice professionalism and remember the meaning behind privilege. So for me wearing the white coat as a learner symbolizes what we owe our patients. And for me as a physician it is a symbol of the immense privilege we have in this profession and the trust we receive every day in every unique doctor-patient relationship. So I wish you all the best in your journey here at the College of Medicine. I look forward to learning alongside and from you. Remember my door is always open and I want to hear from you. And think often of the great privilege you have have been given in this profession of helping people through the doctor-patient relationship. 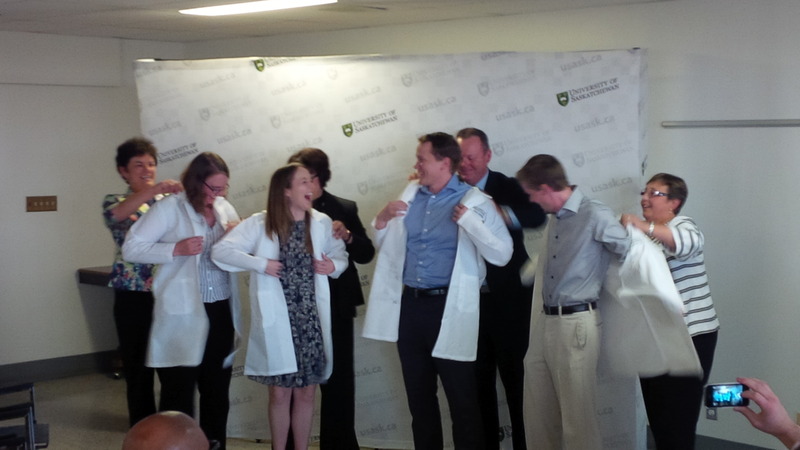 Our Family Medicine Residency Training Program is officially up and running in Moose Jaw. 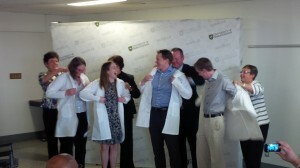 To celebrate, we gifted our first four residents with CoM White coats on September 22.